Upper Deck's Ultimate Collection is one of those high end products more suited for the gambler than the collector. The faint of heart should understand that with high risk can, but not always, come high reward. 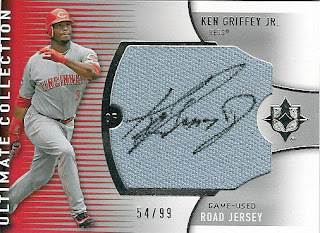 With a current SRP of $105, collectors are guaranteed one major "hit" and two base cards serial numbered to 350. At this price point I'm not sure of the need for base cards as I imagine there are very few, if any, collectors that can afford to tackle what would be an expansive undertaking to assemble the 100-card base set. This isn't a product that you are necessarily going to be able to flip for a profit. However, your chances of pulling a memorable card for your collection are quite good.